A stunning single storey villa with fantastic front-line views from a raised position. The full-width glazed lounge doors open onto spacious front and rear patios (total plot size 500 sq metres), private landscaped gardens and the 6m by 4m swimming pool, offering a perfect tranquil setting for outdoor living. Sun loungers, outdoor dining table with 6 chairs, a swing-seat, barbecue, sun umbrellas, two full sets of golf clubs and tennis rackets are provided. The large rear garden, which contains the swimming pool, faces east/south-east but keeps the sun on the pool until about 5pm in Summer. The front garden with the swing-seat and small table and chairs comes into its own for watching the sun go down with a glass in hand. Inside, the villa is light and airy and offers an open-plan contemporary design with air-conditioning throughout. The central living space has a high ceiling and comprises a comfortable living area, dining table with 6 chairs and fitted kitchen. Recline on the L-shaped leather sofa and armchair in front of a flat-screen TV (full range satellite channels including BBC, ITV, Sky Sports, Sky Cinema, BT Sports and Eurosport), with DVD/CD player, iPod dock and wireless broadband also provided. For winter there is a cosy log-burning fireplace. The kitchen area is fully fitted with a dishwasher, large fridge/freezer, washing machine, ceramic hob, oven/grill and microwave. There is a plentiful supply of good quality crockery, glassware, cutlery, utensils and picnicware. There are three bedrooms leading off the central living area. On one side of the villa is the master bedroom which has a spacious en suite shower room. This bedroom has a 150cm double bed made up with white cotton bedlinen, a large fitted wardrobe with shelving and drawers, two bedside tables and a large wall mirror. On the other side of the villa are two further bedrooms and a shower room shared between them. One of these has twin 90cm beds with a large fitted wardrobe, a bedside table and wall mirror, and the other has two 80cm beds with one stored under the other, a bedside table, wall-mounted shelving space and a mirror and hooks. Both bathrooms have a good quality shower and modern fittings with plentiful towel rails. Each guest will be provided with a large bath towel and hand towel, but these are not suitable for outside use. A further room is available for the storage of golf clubs, sun umbrellas, ironing board, clothes dryer etc. It also contains a large selection of books and games which add to the DVDs and CDs available for guests to use. In the outdoor storage area to the side of the villa is a container for inflatables and toys for taking to the beach or using in the pool. The Peraleja Golf Resort provides a stunning 2nd floor restaurant/bar in the clubhouse (La Vista) which is open daily, together with the 18-hole golf course (NB currently closed until further notice), within easy walking distance of the villa. 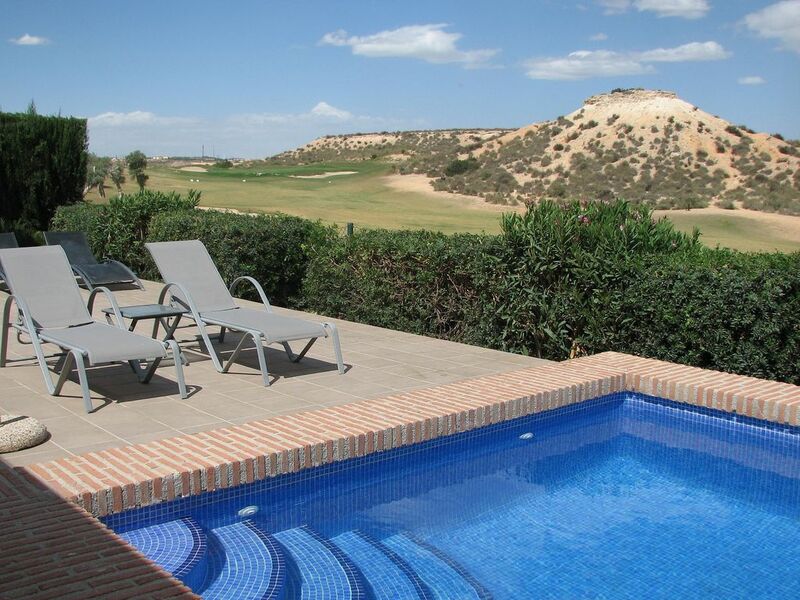 The convenient location of the villa, both within the resort and in the Murcia region, together with the villa's space and facilities make this an ideal property for families, golfing groups and couples. We are an active family of four (children now grown-up) and all enjoy the villa and surrounding area. The golf courses in the region are good quality and easy to access. We have made good use of the excellent clubhouse restaurant which is close to the villa and the shops and cafes in the local village of Sucina. We visit Peraleja Golf several times a year and always quickly relax into the peaceful surroundings, soaking up the abundant sunshine, and we are now enjoying exploring the fascinating inland areas of Murcia. All our guests have loved the villa and its stunning views. We manage the entire booking process and are more than happy to answer any of your queries or provide extra photos. While on holiday at La Manga Club in 2005 we were introduced to Peraleja and were immediately taken by its location in wild open countryside, the plans for luxury low-density development and the stunning architectural design of the open plan villas with sizeable outdoor space. We were one of the first buyers to secure a plot off-plan and now have the enormous benefit of one of the best views on the site. The resort has easy access to Murcia's new airport (25 minutes) and the coast (20 minutes) whilst enjoying a peaceful location with all the shops and facilities you need close to hand. The villa itself is very comfortable and we have furnished it to a high standard. As it is our holiday home too, we have left available a lot of extras for all our guests to use such as two sets of golf clubs, golf trolley, tennis rackets, lilos, DVDs, games and books. The kitchen is very well equipped and we have acted on any guests' suggestions. We believe our villa stands out with its stunning view from a raised position with the dovecote (Peraleja's symbol) close by. The villa has a simple but effective design with a large central open-plan living and kitchen area opening out fully to the spacious outside areas both front and back and we thoroughly enjoy being able to wander in and out with ease. The two modern bathrooms with high quality fittings both have shower, wc, wash hand basin, large mirror and ample towel rails. One is en-suite to the master double bedroom and the second can be accessed directly from each of bedrooms 2 and 3. Air conditioning available throughout the villa. Not to be used while doors are open or when the villa is unoccupied. Electric radiators in bedrooms, log fire in living area and heating via air con vents if needed. White cotton bed linen. All bedding provided to include sheet/bedspread in Summer and duvet in Winter. Changed on a weekly basis and laundry costs included in rental. Log fire in living room. Logs can usually be bought at the local garage in Sucina. Room for one car under a pergola at the villa plus plenty of spaces over the road. Soft white bath and hand towels and bath mats provided. Changed on a weekly basis and laundry costs included in rental. These towels are not for outdoor use so please bring own swimming/beach towels. WiFi provided with code on the router in the living room. Open plan with the kitchen and dining area under a high vaulted wood-beamed ceiling. Includes a large L-shaped red leather sofa, leather armchair, coffee table, extendable dining table and 6 chairs. Fridge/freezer, ceramic hob, electric oven, microwave, dishwasher, kettle, toaster, coffee makers and plenty of saucepans, utensils, crockery and cutlery. Modern glass-topped table with 6 comfortable dining chairs. Can be extended to seat 8 people. Full range of satellite TV channels including BBC, ITV, Sky Sports/Cinema, BT Sports and Eurosport. Selection of DVDs and CDs available to play through the DVD player. Novels and children's books in the storage room. Front and rear gardens containing typical Mediterranean plants including palm tree and olive trees. Large front and rear patio areas with ample seating and sun loungers. Two sun umbrellas and a swingseat. Outside dining table and chairs for 6 people. The golf course at Peraleja is currently closed awaiting new investors. There are numerous other courses in the Costa Calida area and two sets of golf clubs at the villa for guests to use. Private pool approx. 6m by 4m in rear garden which is cleaned twice a week in Summer and once a week in Winter. Unheated. NB The pool is not fenced off so young children need to be monitored. Air-conditioning throughout the villa. Electric radiators and log fire. Suitable for children and a cot with bedding and high chair can be provided at a small extra charge. However, please note that the swimming pool is not fenced off in the garden. No smoking or pets inside the villa please. The villa's open plan living area has large concertina doors to the front and sliding doors to the rear that can be opened fully onto each of the patios, providing a natural extension to the living area of the villa. The large private enclosed garden is landscaped with a palm tree, olive and orange trees and other typical Mediterranean plants. The villa has its own swimming pool (approx 6m by 4m), sun loungers, swing-seat, table and 6 chairs, Weber barbecue and large sun umbrellas. Private car parking is provided for one car under a pergola and further convenient parking is available on the road. Separate storage room containing two full sets of golf clubs, golf trolley and several rackets for guest use, together with books and games. Iron, ironing board and clothes dryer are provided. Lilos and other pool/beach equipment also available. Bed linen and bath and hand towels (not for outdoor use) are included and the villa will be cleaned and the beds made up ready for your arrival. Linen and towels can be changed and the villa cleaned for stays longer than one week. Villa was gorgeous equipped with everything you could possibly want and more! The owners and the property managers were so helpful dropping off some drinks for us when we arrived late and the local supermarket was closed. The information pack in the villa was very informative. With info on the villa itself, local restaurants and places to shop. The resort itself is peaceful and quiet but is close to Murcia City and Cartagena where there is lots to do and see. The little village of Sucina is also just a mile or so away and has some lovely little places to have a coffee or a glass of wine. The golf resort is closed at the moment but as neither of us are golfers that wasn’t a problem. If you are, then there are many other courses very close by. Would highly recommend this holiday to all. Our family (2 adults and three children) thoroughly enjoyed our stay at Paraleja Golf. The villa was very well equipped with everything you could possibly need and was also thankfully air conditioned. The complex itself is interesting, because so many of the properties are vacant, but that did ensure that it’s nice and quiet! The on-site restaurant is definitely worth a visit. The pool was perfect and a lovely temperature. We enjoyed our visits to Sucina, La Manga and Categena, and would definitely recommend this property. We're very glad you enjoyed the villa and restaurant at Peraleja Golf so much and the surrounding area. Many thanks for recommending us! The property was v clean and well appointed with lots of kitchen equipment which is always a bonus. The linen was crisp and the towels fluffy. The pool was lovely and warm and the huge bonus for us was that it was very quiet indeed. Instructions and directions were very detailed and got us to the villa without the aid of the stat nav. We had a great holiday and would recommend it to friends. A shame the golf course was not open but in our case that was probably a bonus as none of us play!! We had lovely days out in Murcia and Catagena and Cabo Tinoso and spent a nice evening at Cabo de Palos. The owner and managing agents do everything possible for you to enjoy a carefree and positive experience holidaying in this lovely area. A lovely villa in a quiet community. Only a 20 minute drive from San Javier airport. The villa had everything we needed. The flies were a bit of a nuisance and we got some serious mossy bites too!! A great little supermarket (Lesco) in Sucina that sells everything you need and at reasonable prices. Restaurant La Vista, on site, is very good. Food was nice but a little on the pricey side. We had some great days out to Cartagena and Murcia - we used the train service to avoid trying to park in city centres! Excellent train service. We will hopefully be back. This was a perfect place to stay. I couldn't of asked for a better villa. The Murcia region has over 250 kilometres of coastline and a climate that offers over 300 days of sunshine a year. Just 20 minutes drive away from Peraleja Golf resort are a wide choice of local beaches on the Mar Menor (a large, warm inland sea offering a variety of water sports) and the Mediterranean. Of particular note is the Calblanque National Park on the south coast, some 40 minutes drive from the villa, with its miles of unspoilt beaches and renowned flora. Nearest airports are Murcia International (25 minutes drive) and Alicante (55 minutes) which are served by many airlines including EasyJet, Ryanair, Tui, Flybe, BMI, BMI Baby, Jet2 and British Airways from a variety of UK airports. Car hire is easily available at both airports (eg Europcar, Centauro, GoldCar, Firefly and via Holiday Autos). Good local supermarkets offering fresh produce and a bakery are available in the town of Sucina which is 3km (5 minutes drive) away. A large Carrefour supermarket and other shops are available 15 minutes drive away at the Dos Mares shopping centre near San Pedro del Pinatar towards the coast. The cities of Murcia and Cartagena (both approx 30-40 minutes away) offer a wide variety of historical and cultural interest, together with shops, markets and enticing restaurants. Peraleja Golf nestles between the mountains and the Mediterranean Sea/Mar Menor. This low density resort is situated 200 metres above sea level and is noted for the limited extent of development, preserving 60% of its land for local flora and fauna. Facilities include a clubhouse with excellent restaurant and bar which is within easy walking distance of the villa. A welcome pack may be ordered in advance to suit your needs at cost plus 10 euros and payable locally. Arrival/departure days and length of stay are flexible. Arrivals are usually from 4pm and departures by 10am, but these times may be altered with prior agreement depending on other bookings.